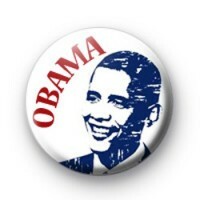 Barack Obama button badge. Do you miss Barack Obama in the White House and wish we could go back to a pre-Trump world? Was Obama your favourite American President, I think he was ours. Our Obama badges help you show your support for Obama even if he is no longer in the White House, politics may have taken a turn for the worst but we still have hope.